Website strategy tends to come easy for designers in some areas, but not in others. 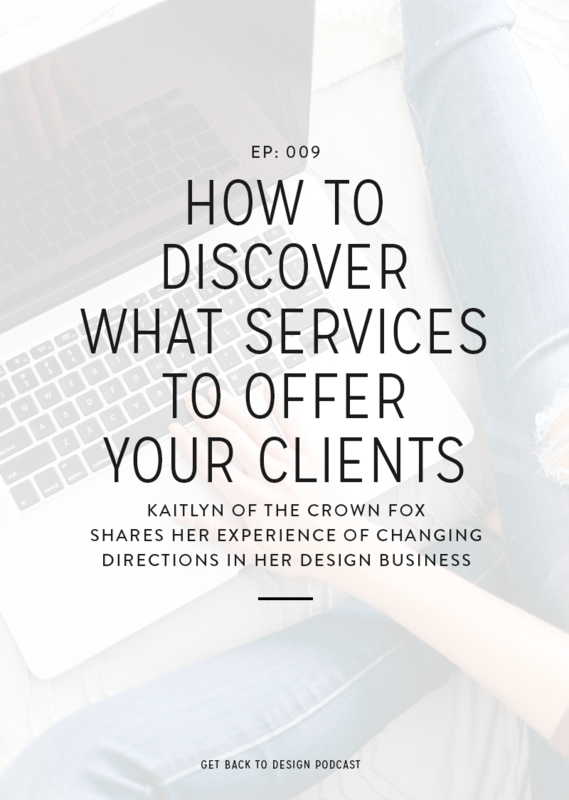 The ones that aren’t quite as easy tend to get overlooked and serve as more of a dumping ground for the client. If there are two places that get overlooked more than others, it seems to be the sidebar and footer areas on a website. Let’s start by talking about where designers tend to go wrong with the sidebar. 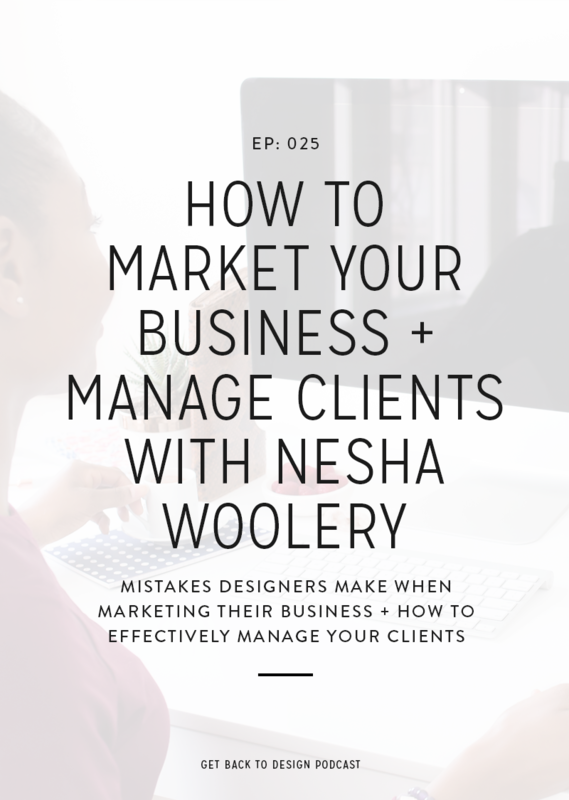 First is the mistake of letting clients decide exactly what goes in that area. Yes, you want to give them a little freedom, but they’re not going to take time to think about what the items they’re requesting will actually do for their business. Next comes including items that don’t support your client’s goals. 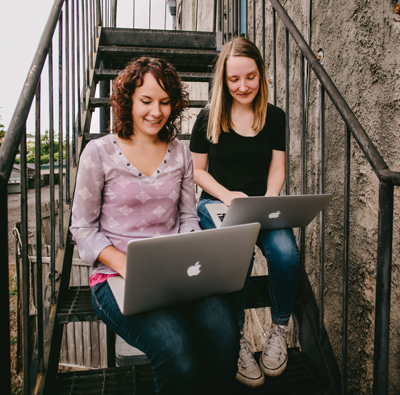 If they said their goals were to grow their email list, build trust, and grow an Instagram following, there shouldn’t be links to other blogs, ads, or other social media widgets in the sidebar. And last comes the mistake of having too many items. An effective sidebar should only have about 4 things in it. Anything more than that becomes a distraction. 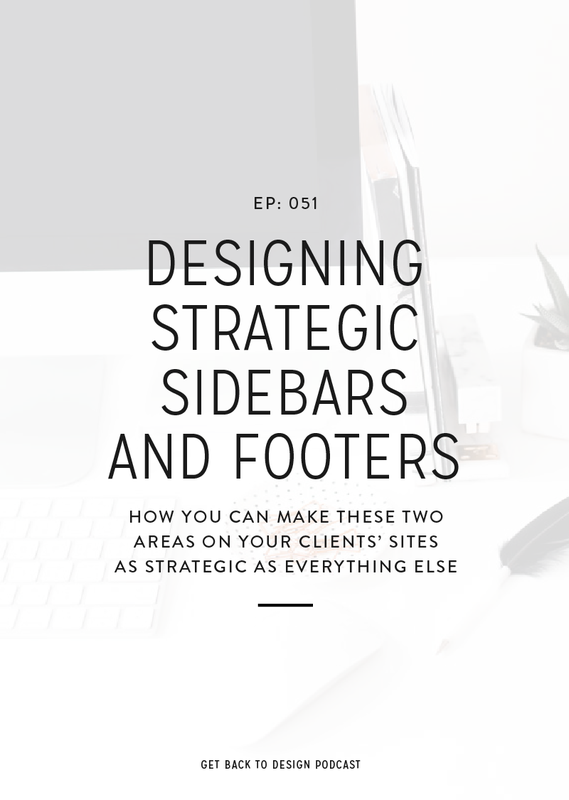 There are a few things you need before diving into designing a strategic sidebar. First is your client’s goals. 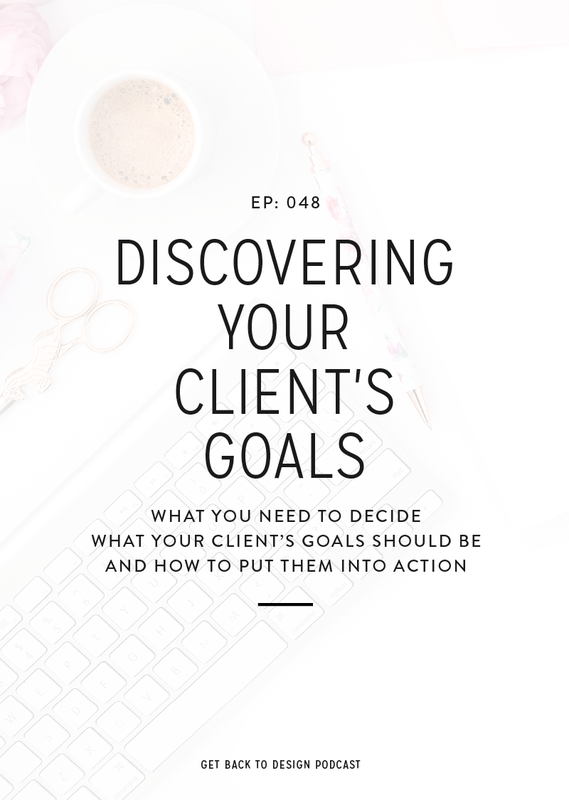 We talked all about discovering your client’s goals in Episode 048. For the sidebar specifically, you’ll want the smaller supporting goals we mentioned. Last, you need to decide which pages the sidebar should be included on, as they shouldn’t be on every page of a website. Only include the sidebar on pages where your client is okay with their audience getting distracted from the main content. For example, the Blog page and blog posts are usually good options, while Shop or Services pages aren’t. A sidebar should almost always start with a headshot and bio, as it’s an easy opportunity to build trust with an audience. The last item should be a search bar – especially if your client runs a blog. Between the headshot and search bar should be items that support each of your client’s goals, starting with the most important. For example, if one of their goals is to grow their email list, an opt-in incentive can be added right under the headshot and bio. Last, let’s talk about what to leave out of a sidebar when you’re designing strategically. First is promotion of high-priced evergreen products. People aren’t likely to land on a website and make a big purchase from a sidebar. Your clients are much better off including an opt-in incentive to get people into a funnel. Next is blog post archives. People aren’t going to click through different months of a year to see what your client posted. Instead, consider including categories. And last is recent posts. Everyone knows to visit the main blog page to view recent posts, so it’s redundant to include them in the sidebar as well. Instead, consider popular or featured posts. If you’ve been guilty of that, it’s totally okay. But read on for how to make it better! Just like the sidebar, there are a couple things you need before getting started on the footer design. First is, once again, your client’s goals. This time you’ll want to focus on which ones people will be ready for when they’ve made it to the bottom of the website. They’re either down there because they’re looking for something specific or they’ve scrolled through a page without finding another call-to-action that interested them. You’ll also want to consider which pages not to include the footer on. Unlike the sidebar, the footer should be on almost every page. 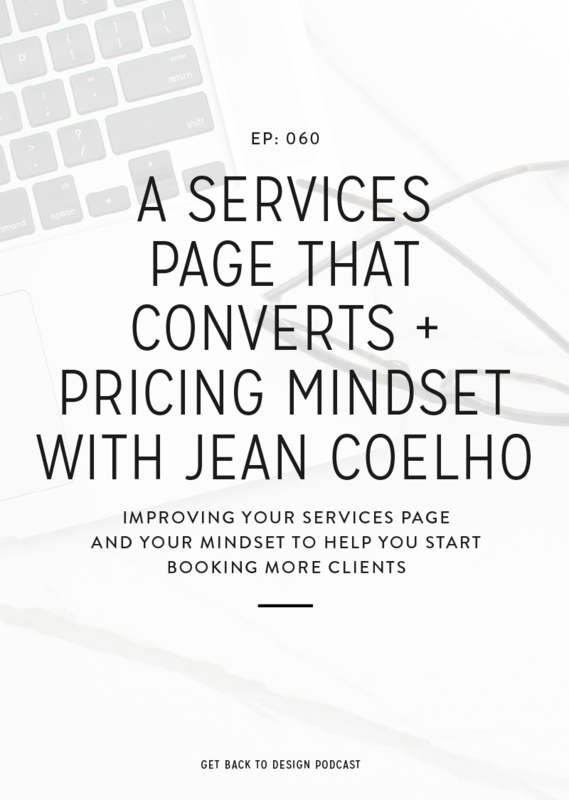 The only exceptions come in places where your client is really focused on one main call-to-action like a landing page, sales page, or services page. When deciding what to include in the footer of a website, you’ll go about it a bit differently than the sidebar. Instead of including items supporting each of your client’s goals, choose just one main call-to-action. For many clients this ends up being an email opt-in. Think of the footer as a place to support an important goal while making the site easier to use. The footer is a pretty flexible area, but consider what people will and won’t be ready for once they’ve made it to the end of a page. For example, asking for a purchase is too much. At this point, the goal should be to keep them on the website. Think about how the sidebar and footer could be better. If it’s your own website, make some updates.